dedicated to delivering quality service. APEX ENVIRONMENTAL offers a comprehensive range of services in the fields of occupational hygiene, environmental monitoring and training. The staff of APEX ENVIRONMENTAL has a broad and comprehensive experience in all environmental monitoring and risk assessments, with a client base of over 1000 companies. As of the end of 2015 we have performed over 2000 studies, and the depth of our experience extends back to 1992. 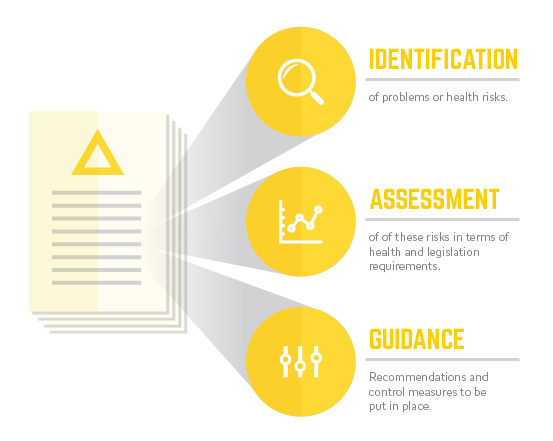 Occupational health risk assessment is a process in which potential health hazards are identified, the extent of the exposure is quantified and compared to legislative standards to assess compliance, the efficacy of existing control measures are evaluated and recommendations then formulated stipulating how legislative compliance can be (or is being) achieved. The environmental division of APEX ENVIRONMENTAL is ultimately dedicated to reducing the carbon footprint of industry. By using a systematic process of effective monitoring and the implementation of “green” strategies, our clients are assured that they are minimizing the negative environmental impact of their company, in a financially viable manner.